When asked what his favorite foods are, my husband will always respond – a good sandwich (preferably a Philly Cheese Steak with Whiz), a killer hamburger (with cheese, of course) and pizza. He swears it’s all about the bread when it comes to a great sandwich, but when it comes to pizza he claims that it’s not only the crust, but the proper ratio of sauce to cheese. He firmly believes the less toppings, the better. I know I’ll regret saying this, but he’s right (just this time). I’ve spent two days making pizza. I’m not a baker, but to my surprise the initial fear of using yeast and kneading dough were quickly erased. It was easy! I’d like to say we’ll never order takeout pizza again, but I think that’s a stretch. Homemade certainly doesn’t look perfect like what you pick up at the pizza place, but it definitely tastes great! Here’s the dough recipe I used inspired by Emeril. There are many variations out there, some which use a stand mixer. I selected this recipe because you use your hands – it sounded like fun. Mix the water, yeast, honey and 1 tbsp of the olive oil in a large mixing bowl. Stir and let sit until the yeast foams. Add 1 1/2 cups of the flour and the teaspoon of salt and mix by hand until it starts to come together. Continue to add more flour a 1/4 cup at a time, working the dough after each addition until the dough is smooth but still a little sticky. Both times I made it, I didn’t end up using all the flour. Turn the dough out on a lightly floured surface and knead for a few minutes until it is smooth. Form into a ball. Put the remaining tbsp of olive oil in a large bowl and turn the dough ball to coat, cover with plastic wrap. Let it sit to rise for a couple of hours in a warm, not drafty place. It should double in size. Once the dough has risen, turn it out on a lightly floured surface and have fun! We made three kinds of pizza as you can see in the photos above. 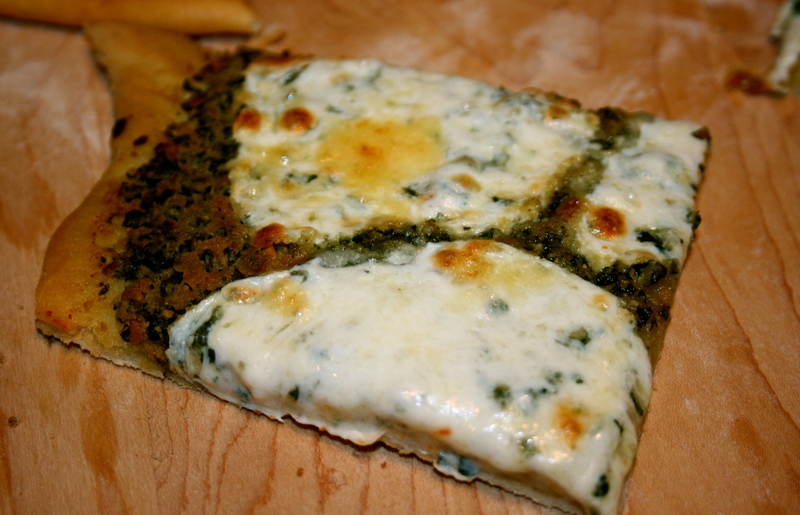 Pizza Margherita, pesto pizza (both with fresh mozzarella and basil) and the third is similar to what the French call a Pissadeliere and the Spanish call a Coca de Cebes. 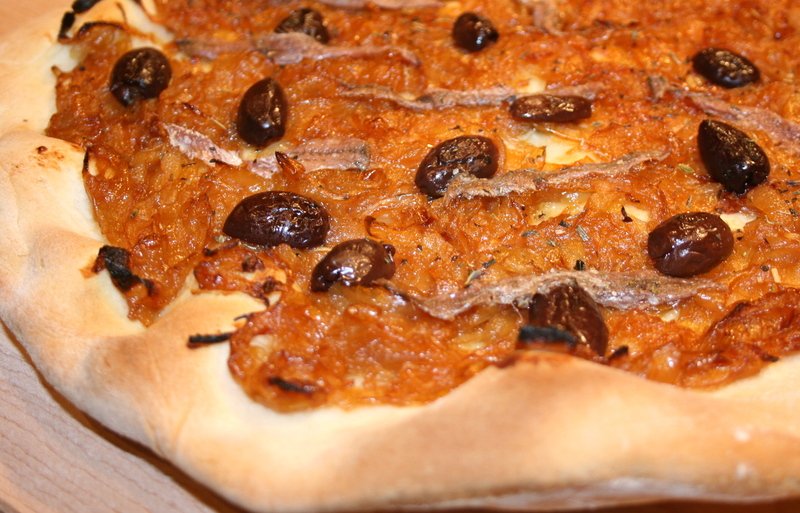 Using a pizza crust, I call it another opportunity to eat anchovies. I see a lot more homemade pizza in our future. Did you know that you can’t see your photos? A little FYI for you. I am really enjoying your blog. Good Job! I wonder if it’s your PC? I haven’t had anyone else not be able to see the pictures. Do you use a PC and if yes, what version of IE are you running? That might be it. Please let me know. Also, are you referring to the pics on the blog or in the email you receive with a new post? Thanks for letting me know. Please keep me posted. I love the site! I have a question: what did you bake your pizzas on? And how did you transfer it from a floured surface to what you were baking it on? I tried last weekend to make a pizza and it was a totally disaster. 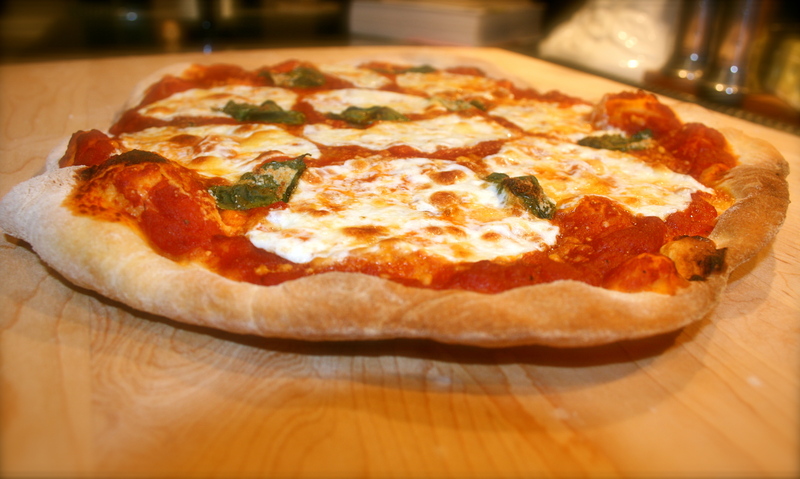 =( I can make bread and baked goods… but I just cannot make pizza. it was to fragile when I stretched it out and I couldn’t transfer it to a pan to be baked. So any advice would be helpful! =) Looks delicious! Thank you so much for checking out my site! I’m glad you like it. It’s been a process as I’m sure you understand. The pizza was really yummy. I baked them on a pizza stone. I just keep the stone in the oven all the time. You should preheat the stone with the oven (cold stone, cold oven). When I make the pizza, I roll out the dough on a large board and then transfer it to a pizza peel that has a sprinkle of corn meal on it. Put your toppings on the pizza after you have transferred the plain, rolled out dough onto the peel. The coarse corn meal will help to shimmy the pizza onto the stone in the oven. I know it can be hard to transfer it to the oven, but the corn meal does helps. Make sure to use coarse corn meal and not flour textured. If you don’t have a pizza peel you could use a rimless cookie sheet. I highly recommend using a pizza stone. The crust comes out really crisp. I hope this helps. Let me know if you have any other questions.